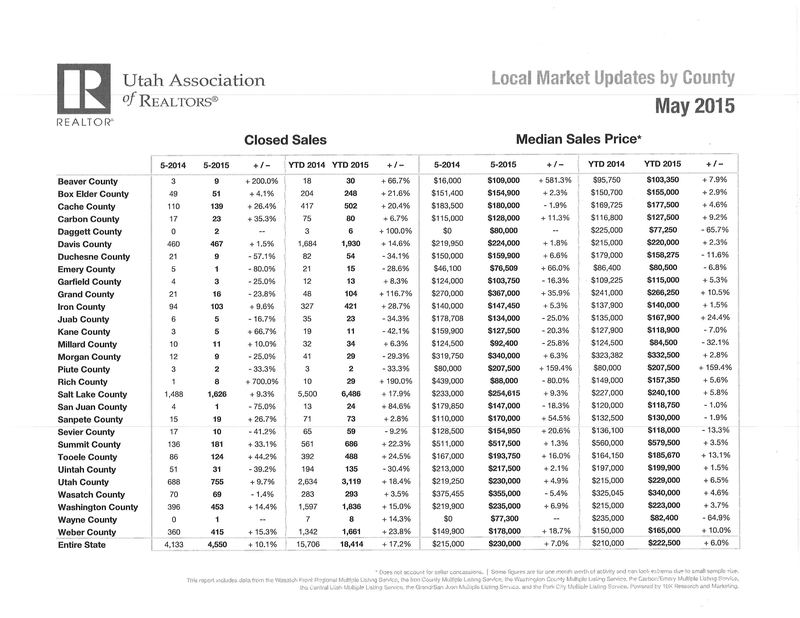 Summer has seen increased real estate activity and prices that are slightly up for most counties in Utah including Southern Utah. 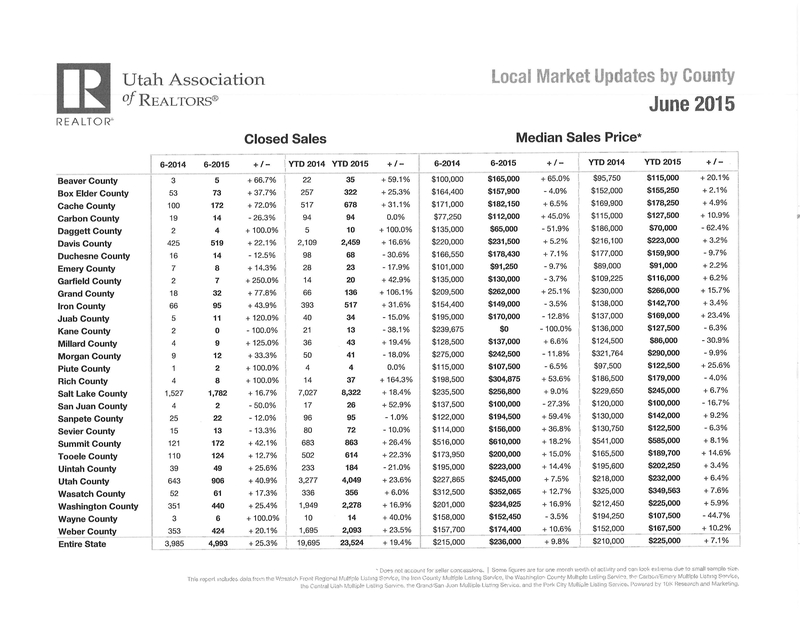 Attached are the Utah Association of REALTORS (UAR) Local Market Updates by County for June 2015. This is the latest report available since it takes UAR approximately 2-3 months to compile these statistics. Information for all Utah counties is attached. Iron County Year to Date (YTD) closed sales for 2015 as compared to 2014 are up 31.6%. The Median Sales Price is up to $142,700 which is a 3.4% rise. Increases in buyers buying and decreases in inventory in some price ranges are causing slight rises in sales prices. You will see in the attached graphs that ERA Realty Center sold more homes and properties than any other office. ERA sold more of its own listings as well as more of the other offices’ listings. This has been true for many years. We appreciate all of our clients and customers for working with us! Thank you! Our local economy seems to be doing well and our employment rate is good. Interest rates are still really great, so monthly payments are often lowers than rent. Home ownership is a great opportunity now. We recommend both buying and selling in this steady market. All can come out as winners in the world of real estate! Move-up buyers are in the market according to the REALTOR Magazine. I quote, “…a very encouraging trend that has been developing is the rising participation of trade-up buyers…” There are also buyers looking for smaller homes. Investors are buying single family homes but would like to purchase more duplexes and 4-plexes if there were more newer units available. New construction homes are selling and speculation homes are available for sale. Of course, we always have first-time buyers in our market and buyers moving here from out of state due to our friendly atmosphere and the good feeling that exists in our communities! Renters are looking for rentals according to local rental managers. Therefore, we believe this is an excellent time to add rental properties to your investment portfolio! Owning a rental property in a college town is a great idea! Why not let a tenant purchase a home for you! You can have a little extra income along the way; and when the building is paid off, use the money for retirement, your children or grandchildren’s college education or a fun trip, and etc. I don’t know of any other investment that someone else actually buys for you! I do practice that advice and own several rentals. I am truly grateful to my tenants for purchasing them for me. The benefits definitely out-way the downside in my opinion. aggressive marketing is still the best which we will continue to do for you. Pricing and staging are also important in order to mark that home or property sold. We advertise your real estate all over the world, so you should be getting activity and offers if pricing and staging are competitive. Please feel free to call our Naisbitt-Bagley Team at 435-865-1019 for more helpful hints or to borrow our informative DVD or email bagleyteam@gmail.com. To answer questions and concerns, please text or call Matt Bagley at 435-590-8788, Jennifer Corral at 435-559-0366 and Janet Naisbitt at 435-559-7772. We would love our experience, top training, top service and expertise to benefit you in all stages of your real estate transaction. and publish the statistics for every county in Utah. commercial properties and lots are still slow movers but they are moving. properties, now would be a good time to purchase a rental property. want to tour, so our global online marketing is of utmost benefit to you. nation and all over the world! nation and world to buyers and agents. well as DVDs on preparing your home for sale. get your home or property sold. Thank you very much!